My obsession with Spaghetti Squash began after my first taste, and I’ve been playing around with different ways to use it in my cooking. I’ve used it in a baked casserole dish, added it to pasta, and in place of pasta. 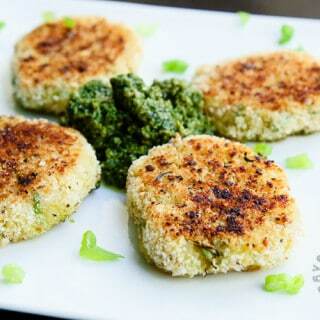 Then I thought of making simple delicious Patties out of it! I wanted to keep the flavors simple in order to highlight the strands of spaghetti squash, but need to keep the patties from falling apart. 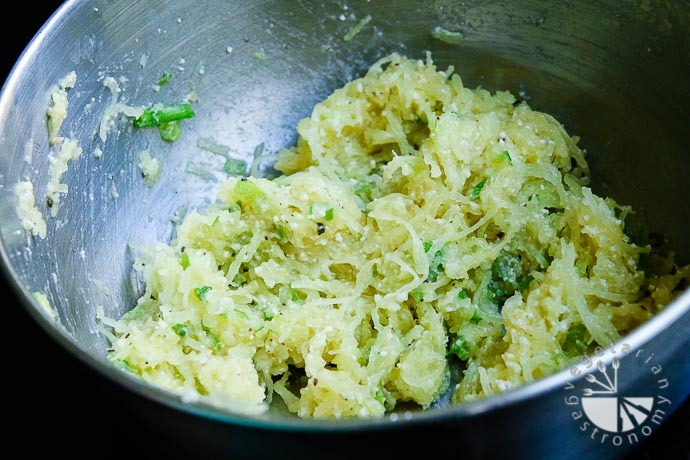 After experimenting with a few different ingredients, I found the combination of spaghetti squash strands, green onions, fresh garlic, Parmesan cheese, salt, and freshly ground pepper did the trick. 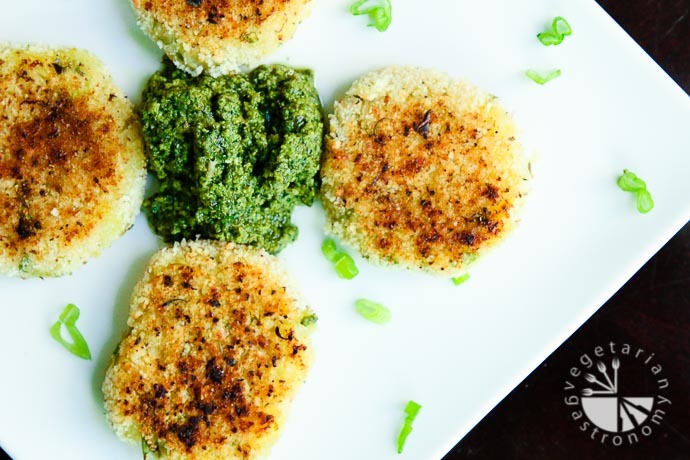 To add a little texture and crispiness, I decided to cover the patties with seasoned breadcrumbs before grilling them on the pan. I personally love using Olive Oil Cooking Spray to cook these because the spray allows you to cover the entire area of a pan without using much oil. 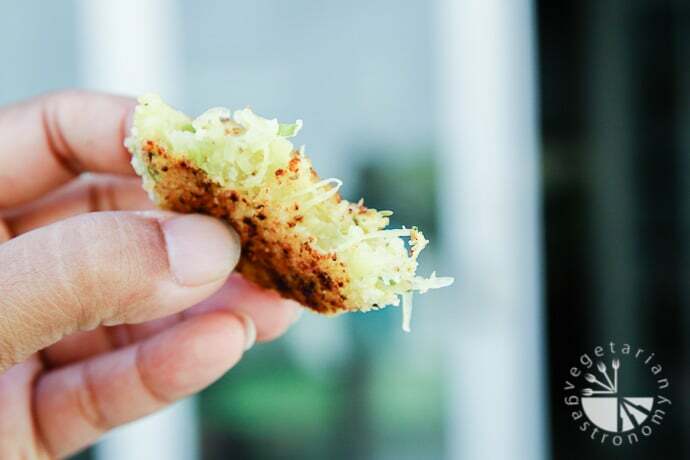 You can easily make a batch of the spaghetti squash mixture ahead of time and just cook the patties when you’re ready to serve, or even store cooked patties in the fridge and reheat them as needed. These patties are delicious! You can eat them plain (as I did the first time), or serve it with some fresh Pesto, hot sauce, or your favorite dipping sauce. The first batch I made didn’t even make it to my kids or my husband because I couldn’t keep my hands off them as they came hot off the pan. I made a second batch for my kids for lunch and they enjoyed them again. It was great to see my son holding the patties by himself without having them fall apart. I’m definitely adding this to my list of lunch items I can send with him once school starts again. After coming home and hearing about how delicious the patties were, my husband finally got to enjoy them himself with some fresh Pesto on the side. If you’ve never cooked a spaghetti squash or are scared of picking one up, do it TODAY! I know you will love it. You can follow my easy recipe below on how to cook a spaghetti squash in the oven. Once it’s cooked and stranded, your options on how to use it are endless. 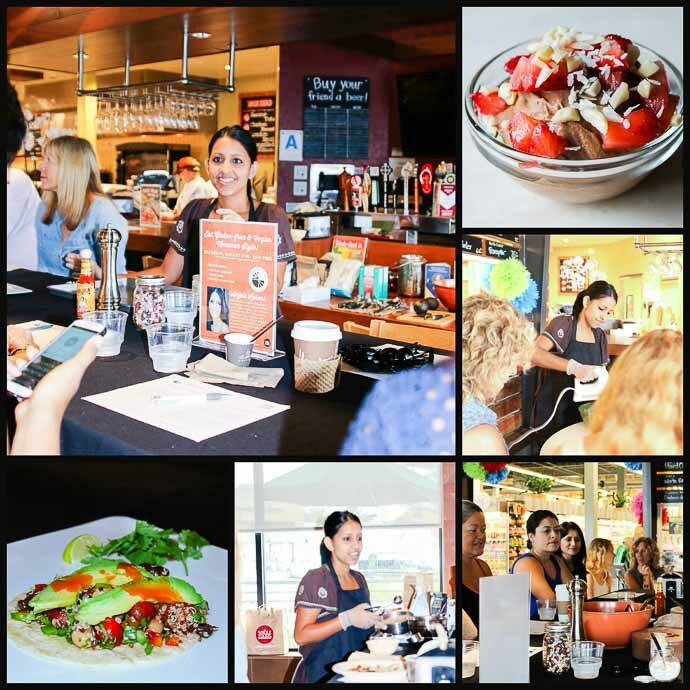 First off, I taught my VERY FIRST Cooking Class ever at the Whole Foods Market in Del Mar, San Diego!! The class was a huge success! The class was full of people eager to learn how to cook new dishes, that made it worth every minute. Everyone absolutely loved all 3 of my dishes, and there was no food left over. I had an awesome experience and met some great people. Watching others enjoy my food and hearing them tell me they were going to make the dishes at home reinforced why I love cooking and sharing my recipes. 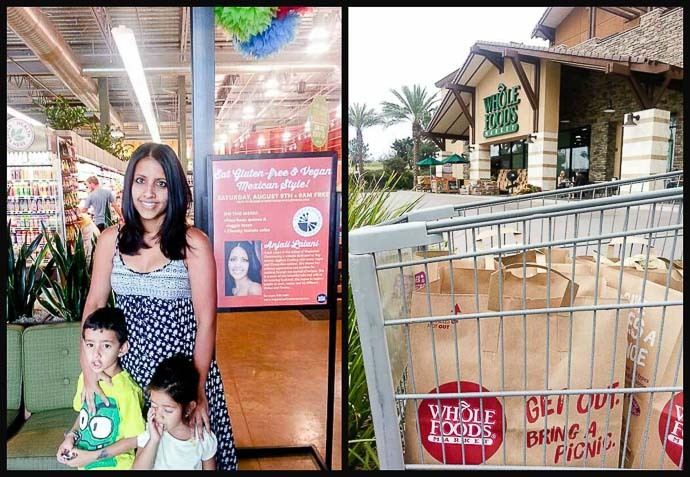 I want to give a big Thank You to Whole Foods Market in Del Mar for the great opportunity! Also, thank you to all my readers for your support…whether it was actually attending the class, wishing me success on my Facebook Page and Instagram Page, or following me on my cooking journey. I plan on getting the 3 recipe cards from the class on my website soon, in case you want to download them. For those of you who missed my first class, I’ve been invited back by Whole Foods in Del Mar, and will probably be teaching a class there every other month, my next one being sometime in October. 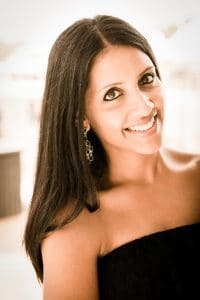 I will definitely keep you updated on upcoming classes. At the end of my class, my husband brought my kids to see me finish up and helped me pack up. He told me that my son had been excited all morning to see me cook. When I saw him, he said, “Mommy… who was your teacher for this cooking class?” I laughed and had a huge smile on my face as I said, “honey, I’m the teacher!” Although I realized he hadn’t initially grasped the notion that I was teaching the class, his excitement over the realization made my day! 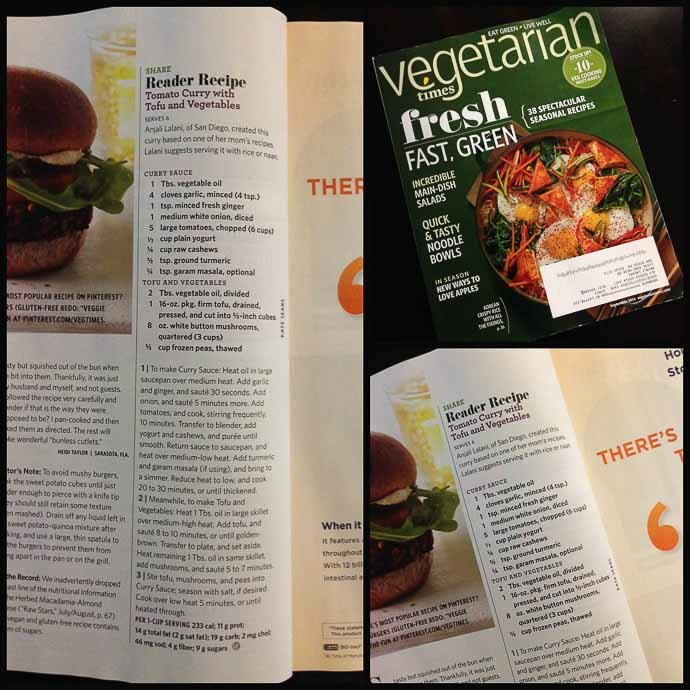 Secondly, I was so excited to receive my copy of Vegetarian Times, September 2014 issue in the mail two days ago. Guess who’s recipe is featured on Page 10 of the magazine? 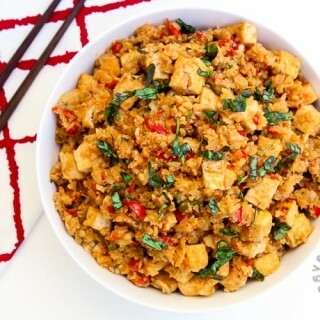 My Tomato Curry w/Tofu & Vegetables!! 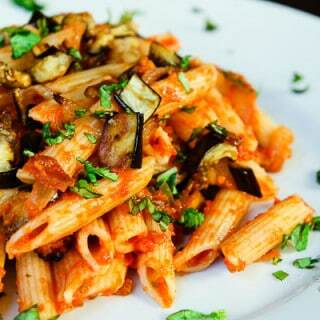 The recipe is featured as the Reader Recipe; you can also view the recipe on the Vegetarian Times website. I only submitted once and heard back from the edit of the magazine a few months ago saying they loved the dish and would like to feature it in the September issue. It’s a small feature, but great to see my name and recipe in such a wonderful magazine, especially one that I’ve been subscribing to for 10+ years. Thank you for allowing me to share my exciting news with you. 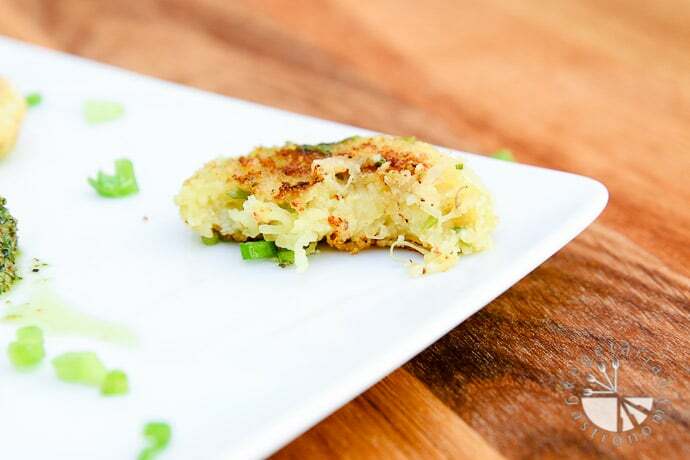 And now onto this delicious recipe for Spaghetti Squash Patties! 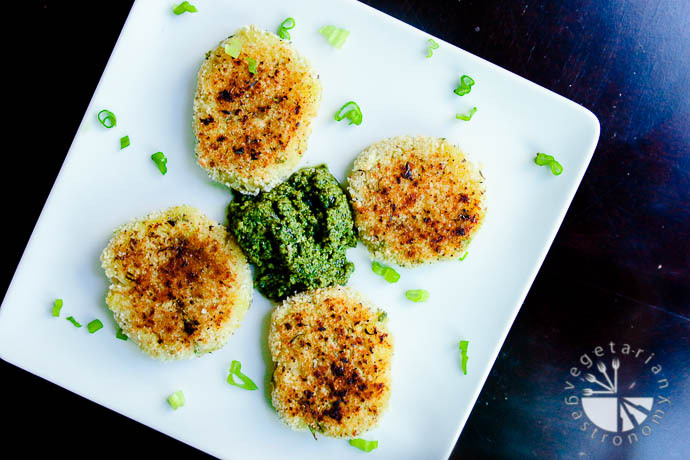 These are the perfect finger-size patties to serve on the side, enjoy as appetizers, or pack for your kids school lunch! In a mixing bowl, thoroughly combine the prepared spaghetti squash, vegan Parmesan cheese, chopped green onions, and minced garlic cloves. Add salt and freshly ground black pepper to taste. 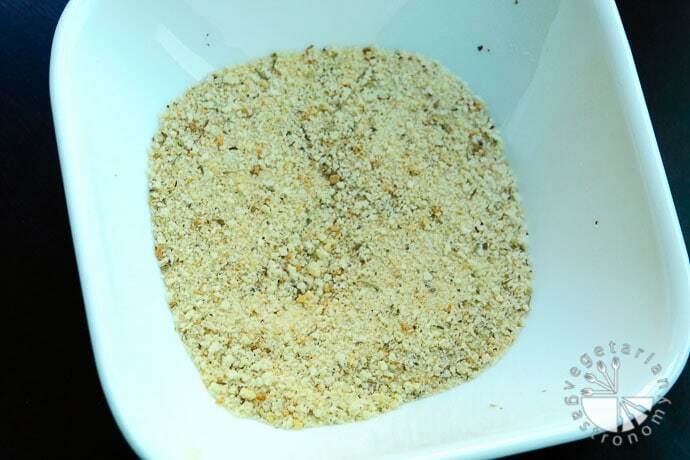 In another small bowl, combine all the ingredients for the Breadcrumb mixture. Heat a large non-stick pan or skillet on medium-low heat. At this point, you should have a spaghetti squash mixture that you can form into 4 to 6 patties. To make each patty, form a ~3-inch round ball and slightly press down in the palm of your hands to form a thick patty. 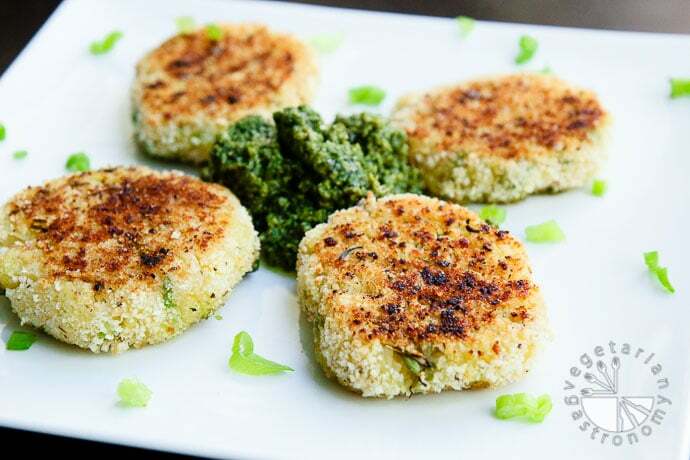 Carefully coat each side of the patty with the breadcrumb mixture by placing the patty in the breadcrumb mixture bowl and allowing the breadcrumb mixture to stick to the patty on both sides. Spray olive oil or drizzle some olive oil on the heated pan. 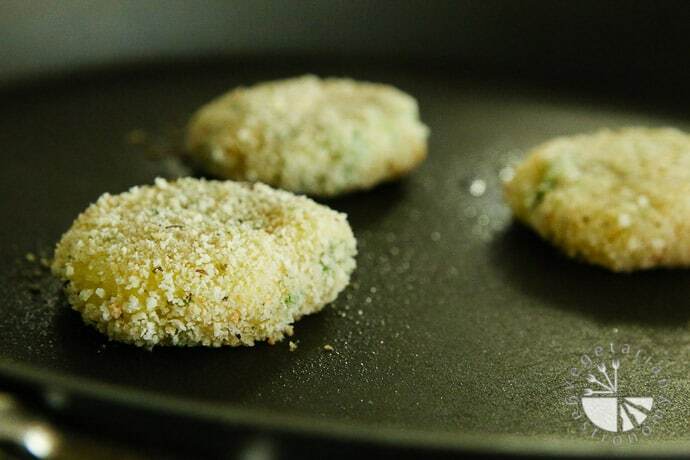 Add the breadcrumb coated patties on the pan (you can add all the patties at once on the pan). Cook for 7-10 minutes or until the bottoms are deeply browned. Carefully flip the patties with a spatula and cook the other side for 5-10 minutes or until golden. Spray more oil on the skillet before flipping if needed. (Note: do NOT cover the patties while cooking). Serve plain or with your favorite dipping sauce or hot sauce. One of my favorites is serving it with some fresh pesto! Sprinkle both halves with salt and pepper. Place each half face down on a baking sheet lined with parchment paper. Bake for 25-40 minutes or until a fork or knife pierces through easily. Be sure not to over-bake the squash, otherwise you may not get strands out. Depending on the size of your squash it may take more or less time to bake. Once the squash is cooked, cool until you are able to handle them, and scrape the insides of the spaghetti squash out using a fork so that you create "spaghetti"-like strands. Thank you Danielle! So glad you enjoyed them! What a great recipe Danielle. My wife and I were looking 4 something to do with our spaghetti squash. Thank you very much for the wonderful idea. Thanks John! These are really easy and delicious! Let me know how you like them! I also have a popular baked spaghetti squash dish on my site as well! Spaghetti squash patty was much better than potatoes. We loved it.